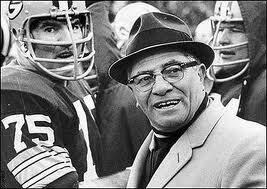 Famous Sports Quotes can motivate and inspire you and sometimes, as in the case of Yogi (Berra) they make you laugh. What is it about these sports quotes that we find so interesting? Perhaps it's because somewhere in the back of our minds, we see ourselves as part of the action---Celebrating in victory & reflecting in defeat. Please enjoy these sports quotes---use them to motivate yourself. Take them to work with you-- so that you can motivate and inspire your fellow workers, or your employees. and a customer will recognize both. you will be amazed at what you can accomplish in your life. of the combined effort of each individual. and that is to give it everything. I do, and I demand that my players do. you'll be fired with enthusiasm. You never win a game unless you beat the guy in front of you. The score on the board doesn't mean a thing. You've got to win the war with the man in front of you. You've got to get your man. Success is like anything worthwhile. the point where success is possible. you must pay the price to stay there. but rather in a lack of will. to achieve any goal that is worthwhile. it's an all the time thing. Looking for a motivational poster for yourself or a gift? Search right from here. Use search box below. There is no room in your mind for negative thoughts. the less chance your mind has to dwell on the emotional. and when you reach your limits, that is real joy. that one would die in the attempt. I figured I was dead. Hope you found these famous sports quotes thought provoking and usefull. Have some quotes or feedback you want to share with us? Do you need any sports equipment?